How Far is Aashrayaa Serenity? 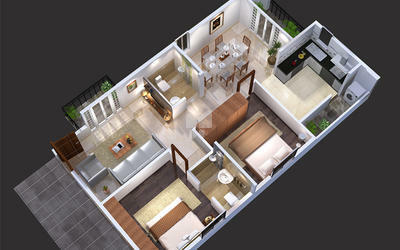 Aashraya Projects has launched yet another project in Bangalore. Aashrayaa Serenity is located in Akshaya Nagara and is in close proximity to Arekere Lake. 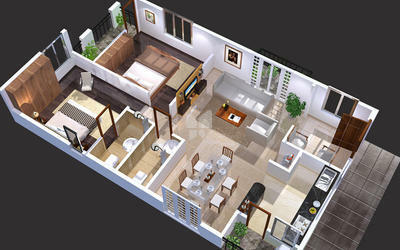 "Aashrayaa Serenity" is a zero energy development initiative. A self sufficient neighbourhood, "Aashrayaa Serenity" comprising the combination of Villas and Bungalows that suit every one’s taste and the entire project is being designed in such a way that maximum importance is given to the nature. RCC framed structure designed to seismic resistance Zone-II with CC block Masonary walls. Granite kitchen platform with stainless steel sink with drain board. Glazed Ceramic tiles dado upto 2ft height above the kitchen platform Provision for washing machine in utility area. Provision for Electronic water purification system. 2X2 Vitrified tile flooring in all bedrooms, living dining and kitchen. Antiskid ceramic tiles in Bathroom Ceramic tiles dado upto 7’ height in all bathrooms Balconies terracotta colored tile Granite flooring for lift lobby. Main Door – Teak wood frame and designer veneer door shutter with Melamine polish on both sides and brass/SS hardware. Internal Door – Door frame of red Sal/Red meranti shutters with Pre- Engineered, pre moulded skin doors, French doors in balcony with powder coated/ anodized aluminum. Window – Powder coated/Anodized aluminum 3 tracks with mosquito mesh. FinolexConcealed copper wiring with flame retardant. Modular Switches of Anchor Roma/Havells or equivalent. Two switches for fan and light in bedrooms Power points provision for kitchen appliances including refrigerator Optional split AC units in Living & Bedrooms. Internal wall/ceiling – smooth plaster with Emulsion(Asian or equivalent)Paint. External walls – Weather proof premium brand paint over Plaster. All sanitary wares – Hindware/Parryware or Equivalent All CP fittings Jaguar or Equivalent.Water supply piping Premium quality CPVC Sanitary and rain water piping. All soil/waste pipes of UPVC.